Scott Docherty, rugby captain at University of St Andrews, and Nick Stephen, his opposite number at the University of Edinburgh, at Murrayfield's Royal Bank of Scotland Scottish Varsity Match in 2016 (picture by Scottish Rugby/SNS Images). Two of Scotland’s ancient universities, Edinburgh and St Andrews, are set to clash for the first time at the Aberdeen Asset Management Melrose 7s on April 8. The match, between the university rugby sevens teams, will take place prior to the tournament final in front of a crowd of thousands at the Greenyards. The 2017 tournament is expected to be hotly contested, with guest teams from Western Province (RSA), Sweden, Co-optimists and Harlequins joining Scottish clubs in competing for the coveted Melrose Sevens Ladies Cup. Trevor Jackson, president of Melrose RFC, said the prospect of having two of Scotland’s ancient universities add to the exceptional atmosphere at the Melrose 7s was truly exciting. David Ross, director of rugby at St Andrews University, said it was delighted to accept the invitation to be part of the Melrose 7s this year in what was a great addition to the tournament. “To showcase our rugby programme in front of a huge crowd is something we are used to with the Scottish Varsity Match at BT Murrayfield – but to get the opportunity to play at the home of 7s in such a prestigious and world-class event is a special honour for our club,” he added. 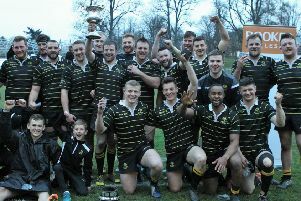 David Adamson, head of men’s rugby at Edinburgh, said: “Edinburgh University RFC has a strong and proud tradition of 7s, having participated in a number of tournaments all around the world in the past 10 years, and having been part of the ‘King of the 7s’ since its inception. “But to be invited to participate against our oldest rivals, the University of St Andrews, at the oldest 7s tournament in the world is a great honour and one that our players and club can’t wait to embrace and be part of. “To have two of the world’s oldest Universities playing at the home of 7s, at a time when the abbreviated version of the game is going from strength to strength and attracting a more and more diverse audience, the Aberdeen Asset Management Melrose 7s seems like the perfect partnership, for Melrose RFC and our two universities to be part of. Councillor David Parker, leader of Scottish Borders Council, said: “Melrose Sevens seems the perfect setting for two of Scotland’s oldest universities to face each other, and should encourage even more visitors to make their way to the picturesque Borders town for this year’s tournament. The University of Edinburgh and the University of St Andrews recently contested the Royal Bank of Scotland Scottish Varsity Match at the BT Murrayfield Stadium in front of 10,000 plus fans. Tickets for the 7s are available fromwww.melrose7s.comor directly from Melrose Rugby Club. The draw for the tournament will be made in the clubrooms at the Greenyards on a date to be confirmed. Members of the public wishing to attend will be made welcome, while details will be posted on the website, social media and weekly newsletter when the date is available. Scott Docherty, rugby captain at University of St Andrews, and Nick Stephen, his opposite number at the University of Edinburgh, at The Royal Bank of Scotland Scottish Varsity Match in 2016 (picture by Scottish Rugby/SNS Images).